A weekend of upsets in the World Series of Boxing (WSB) with the Dolce & Gabbana Milano Thunder tasting defeat for the first time this season as Los Angeles Matadors triumph in style. The Mexico City Guerreros beat their travel blues to impose themselves against Paris United and Astana Arlans stun Bangkok Elephants by taking late victory. Venky's Mumbai Fighters continue to struggle with Dynamo Moscow taking the win in India, Baku Fires dish out the punishment to Istanbul Bosphorus and Leipzig Leopards overwhelm the Beijing Dragons in top quality weekend of action. In front of the watching AIBA President and WSB Board Chariman, Dr. Ching-Kuo Wu and all seven AIBA Commissions members (Athletes & Youth, Coaches, Medical, Refereeing & Judging, Technical & Rules, Women's and WSB), the Bangkok Elephants looked to be on course for a famous win but the visiting Astana Arlans had other ideas. The excellent southpaw Wuttichai Masuk had the thousands of fans in delirium as he gave the home team the early advantage with a resounding win as he outboxed Adlet Yegizekov in the opening Lightweight contest. Daniyar Ustembayev levelled the score after a solid points win against the experienced Kriangkai Sukkhum as the Light Heavyweights showcased their skills. Highly anticipated, the clash between Cameroon's Blaise Yepmou Mendouo of the Bangkok Elephants and the hard-hitting Algerian Chouaib Bouloudinats had the crowds on the edge of their seats as the pair slugged it out for five nail-biting rounds. In the end of this hotly contested Heavyweight fight where two African Champions came head-to-head, it was Bouloudinats who triumphed by split decision. A more aggressive approach could have turned the match in favour of the impressive Mendouo, but in any case the Bangkok fans had a new hero. Another exciting southpaw, this time Bantamweight Donchai Thathi, did not disappoint in his bout as he put in an intelligent display against the tough Uzbek Rafikjon Sultonov. Perfectly poised then, it was the turn of the Middleweight decider. Up-and-coming 21-year-old Kazak Miras Bairkhanov imposed himself to ensure a 3:2 win for the visitors with a thumping TKO victory, cementing in the process his team's second place in Group A. So close yet so far for Bangkok Elephants, but they will have taken great heart from this performance. Can anyone stop the Baku Fires this season? Once again the Azeri outfit was too strong for their opponents as they completely overpowered the visiting Istanbul Bosphorus to win 5:0. Still unbeaten and looking better every week, they are frighteningly good this season. With a bulging squad that is full of power and quality, the Baku Fires are now one win away from guaranteeing top spot in Group B. The night's first two contests saw points victories each for Magomed Abdulhamidov and Madadi Nagzibekov. However with a combined ten rounds and three judges' scorecards, only one round was scored against them, an impressive statistic that set the tone for the evening. The home team then cranked up the pressure in ruthless style as first Middleweight Hebulla Mursalov, then Azamat Murtuzaliyev and finally Abdulkadir Abdullayev all recorded TKOs in their fights. It was a truly spectacular show of strength by the Baku Fires who delight their expectant fans. Entertainment is what we look for, if we get showboating and goading then even better. The Eric Fowler vs. Juan Javier Carrasco Herrera Lightweight contest had it all. 23-year-old Los Angeles Matadors' Fowler, who has struggled for form this season, started off on the front foot in this fight clearly intent on stamping his authority. But the young Argentine Carrasco of the Dolce & Gabbana Milano Thunder was unfazed as he matched his opponent punch for punch in the early rounds. Fowler though, buoyed by the home crowd grew as the fight went on and connected with enough shots to get the vote of the judges, even if by split decision. It was a great boxing match and a great advert for the competitiveness of the WSB. Los Angeles Matadors sprung the surprise of the weekend by beating the highflying Dolce & Gabbana Milano Thunder 4:1 at the packed Avalon Club in Hollywood. 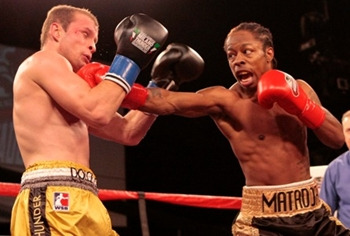 Unstoppable Rau'Shee Warren once again proved his class and extended his unbeaten WSB record to eight fights after a clear victory over 2008 Olympic Games bronze medallist, Veaceslav Gojan. Terrell Gausha and Vyacheslav Shabranskyy then comprehensively defeated Brazilian pair Pedro Lima and namesake Rafael Duarte Lima in the Middle and Light Heavyweight contests respectively. Top ranked Italian Heavyweight superstar Clemente Russo reduced the deficit for the Dolce & Gabbana Milano Thunder as he outmanoeuvred the American David Imoesiri to protect his perfect record. The scoreline was a massive surprise and this win by Los Angeles has now blown Group A wide open with the Italian outfit travelling to Astana next with a win needed or else their status as leaders will be in serious jeopardy. The Matadors have not only registered the result of the season so far but have put themselves back in the reckoning. The Leipzig Leopards put a nightmare run of three successive defeats to bed with a confident performance against the Beijing Dragons in Group B. The German trio of Middleweight Denis Robert Radovan, Kevin Künzel and 33-year-old Alexander Povernov were the leading lights as the German outfit recorded a clinical 5:0 victory. This moral boasting win for the home team should get their campaign back on track following a run of results that had looked like derailing what had been an excellent debut season in WSB. With a tricky trip to Istanbul up next and then the visit of the Baku Fires winning machine, a win from one of these matches should prove enough to guarantee qualification to the quarter-final stages. However in order to avoid the big guns from the other group they will need to consolidate their second position. Huge upset in the French capital as the Mexico City Guerreros defeated Paris United at the Stade Pierre-de-Coubertin 3:2. The reigning Champions had come out with fighting words following a stuttering start to the defence of their title and with the Guerreros notoriously inconsistent on their travels; many predicted Paris United to conquer their opponents in this one. The Mexican team knew this was a defining match in their season so came equipped with some of their best boxers to face the French outfit. As predicted Bantamweight Elias Emigdio and Lightweight Juan Romero ensured a perfect start as they dominated Geoffrey Dos Santos and Abdelkadir Chadi to send the Guerreros into an early lead. French southpaw Michel Tavares showed his prowess to win but in the all-Croatian battle it was Bojan Miskovic who tasted glory against Hrvoje Sep to give the visitors an unassailable lead in the match. Ibrahima Mariko won the Heavyweight contest against Juan Hiracheta but it was too little too late as Paris United suffered their fourth defeat of the season. Venky's Mumbai Fighters vs. Dynamo Moscow was a must win for the Indian Franchise in Group A but after a strong start by debutant Gaurav Bidhuri winning his Bantamweight contest, they then flattered to deceive. Showman Siddarth Varma lived up to his reputation and with the home fighter more intent on entertaining the crowd, his lack of movement left him exposed as Moscow's Adlan Abdurashidov completely outboxed him to tie the match at 1:1. Sanjin-Pol Vrgoc had no response to the power of Maxim Gazizov and Leanid Charnabayeu looked devoid of ideas as Vladimir Sheles outpointed him to give Dynamo Moscow the overall victory. New Zealand newcomer Uaine Fa sent the fans home happy with a win in the evening's Heavyweight contest but this defeat will have hurt the Mumbai Fighters with the race for the quarter-final qualification now out of their hands. Kevin Künzel continues to impress in his first season. The 23-year-old Leipzig Leopards orthodox fighter wowed the crowds at the Maritim Hotel in Halle with a sublime first round demolition of the much taller Beijing Dragons' Yunlong Shi. Künzel has looked razor sharp in each of his bouts and he was once again out of the like a flash in this fight, stamping his authority from the first bell. Extremely positive, the German then unleashed a fierce left-right combination with the left hook catching the Chinese southpaw right on the temple and sending him straight to the canvas. Although Shi managed to get back up, Künzel immediately pounced and let fly from all angles and within seconds the Chinese corner threw in the towel. Compact and mobile, the Leipzig Leopard could really be a force in the Light Heavyweight division; however he will need to prove himself against the best of the best in one of the most exciting and hotly contested weight classes in the competition. "It was a great match. I am very glad that our boxers showcased their skills. I think our fans went home extremely satisfied; they were also a huge factor in our victory. The Istanbul Bosphorus were confident before the match, having notched up two consecutive victories. They travelled with a strong team but our fighters were absolutely awesome tonight. We are now guaranteed a place in the quarter-finals but we want first place in the Group. Looking to the future, it would be very interesting to a final between the Baku Fires and the leaders of Group A, the Dolce & Gabbana Milano Thunder. I think that would be the final that all boxing fans would like to see", stated Gamzat Agaev, Baku Fires Sports Manager.